Size: Can get up to 4", but usally stays under 3"
Minimum tank size: very active fish, 20 gallons for a single specimen, 55 gallons or more if you want to keep a school. Temperment: Peaceful, although when kept in small schools of 5 or less, the weakest chromis will be bullied, sometimes to death. Care level: Easy. These fish are often kept by beginners just to get used to saltwater aquariums. Description: The Green Chromis is found in schools throughout the Indo-Pacific reefs, eastern Africa and in the Red Sea. A very hardy fish, they are commonly kept by themselves in small tanks, or in large schools in bigger reefs, where they add a nice spash of blue-green color, as well as lots of excitement to a community tank. These fish never stop swimming! Solitary chromis should not be kept with agressive fish, as they become very stressed when they are being bullied without the safetly of their school nearby. They should be kept singularily, or in schools of no less than 6, but preferably 8 or more. These fish have a fairly active pecking order, and the weakest may be excluded, shunned from the school, and not allowed to eat. However this only happens when the chromis are kept in small schools, with larger numbers this conspecific agression does not occur. Their diet should include meaty foods like krill, brine and mysis shrimp, as well as a good quality pellet food as well as a algae based food. Feeding a variety as well as nutrient-enriched prepared foods will help keep this fish's colors up. They are very fast eaters, and should not be kept with very slow fish. 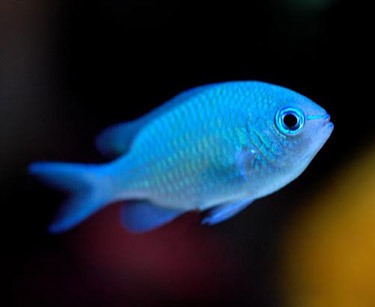 Breeding chromis is relatively not too difficult in the home aquaria. Like many saltwater fish, getting them to spawn isn't too difficult, especially when kept in large schools in large tanks. However raising the fry is extremely challenging for even experienced aquarists. They must have a good-sized tank set up for themselves, as well as top-quality foods and perfect water conditions. Even under near perfect conditions, many chromis do not survive to adulthood.